In a sad milestone, a member of the E Street Band has passed on, and becomes the first to do so. 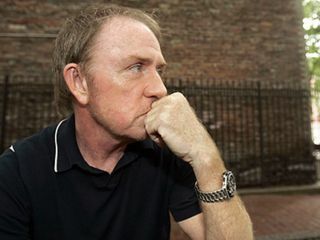 Danny Federici, the longtime keyboard player for Bruce Springsteen, whose stylish work helped define the E Street Band's sound on hits from Hungry Heart through The Rising, died Thursday. He was 58. Federici, who had battled melanoma for three years, died at Memorial Sloan-Kettering Cancer Center in New York. News of his death was posted late Thursday on Springsteen's official website. "Danny and I worked together for 40 years - he was the most wonderfully fluid keyboard player and a pure natural musician. I loved him very much ... we grew up together," Springsteen said in a statement posted on his website. Federici was born in Flemington, N.J., a long pink cadillac ride from the Jersey shore haunts where he first met kindred musical spirit Springsteen in the late '60s. The pair often jammed at the Upstage Club in Asbury Park, N.J., a now-defunct after-hours club that hosted the best musicians in the state. It was Federici, along with original E Street Band drummer Vini Lopez, who first invited Springsteen to join their band. Federici played accordion on the wistful 4th Of July, Asbury Park (Sandy) from Springsteen's second album, and his organ solo was a rousing highlight of Springsteen's first Top 10 hit, Hungry Heart. Federici had taken a leave of absence during the band's tour in November 2007 to pursue treatment for melanoma, and was temporarily replaced by veteran musician Charles Giordano. At the time, Springsteen described Federici as "one of the pillars of our sound and has played beside me as a great friend for more than 40 years. We all eagerly await his healthy and speedy return." He last performed with Springsteen and the band last month, appearing during portions of a March 20 show in Indianapolis.